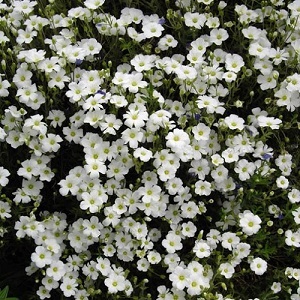 A lovely low growing, mat forming perennial, producing a mass of small white flowers in early summer, typically May to August. This plant has green/grey evergreen leaves and grows to 10-15cm in height. It is very adaptable and grows well in alpine gardens, gravel gardens, pots, beds, front of borders and walls and crevices. Plants grow best in sun or partial shade and poor, well drained sandy soil. Plants grow in sheltered and exposed positions. Sow the seeds on the surface of a tray of seed compost, keep at 20 °C and germination takes 2-4 weeks. If there is no germination, move the tray toa fridge for 4-6 weeks and then back into the warmth for germination. This helps to break seed dormancy. Or sow the seeds in autumn, leave them in a cold frame over winter, and the seeds start to germinate in the spring. Transplant seedlings into pots when they are big enough to handle and out into the garden after the last frost. Grow Plants are evergreen and do not need cutting back. They can be tidied up after flowering. Mature plants can be divided in autumn and basal cuttings taken in early summer.